In 1909, George L. Barden teamed up with Roscoe J. Robeson in Penn Yan, New York, nestled in the heart of the Finger Lakes region, to form a lucrative partnership. 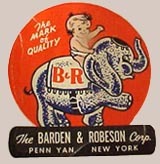 Little did they know, the Barden and Robeson Corporation, which started with production of spokes and hubs for wagon wheels, would become a premier corporation that would continue to flourish for generations to come. 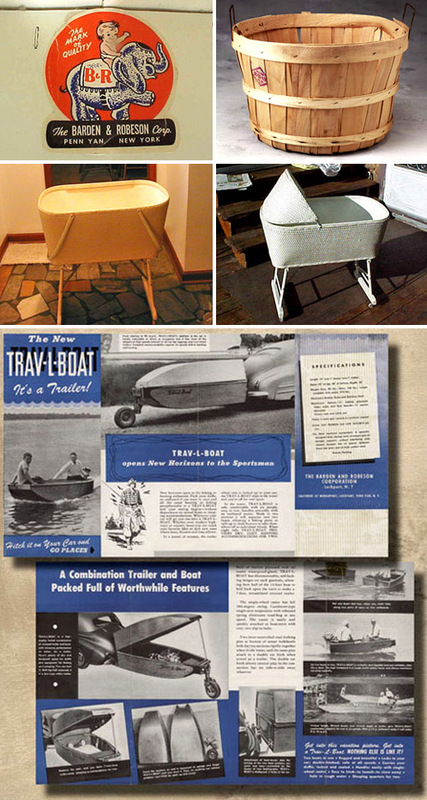 To accommodate the rapidly growing fruit trade in the Finger Lakes region, the Barden and Robeson Corporation changed its focus to bushel baskets in 1911. Business continued to grow and by the 1920's, wicker baby furniture was added to the company's product line. The 1940's brought World War II, which shifted Barden and Robeson's focus once again. Bushel basket and furniture production were put on hold in order to assist the US government in the war effort by assembling ammunition boxes. With the advent of peace, bushel basket and furniture production returned to normal. A surplus of lumber from the ammunition box venture and a major push by the U.S. government for rapid housing in the United States, switched Barden and Robeson's focus yet again. By this time, three production facilities, located in Penn Yan, Middleport, and Lockport, were being utilized in full force, which prompted the endeavor of a new state-of-the-art product, Barden Building Systems. Before long, the Middleport facility was producing this exciting, new method of panelized home construction. Bushel basket and furniture production began a slow decline, while the demand for Barden homes grew so quickly that in 1968, the company opened the doors to another production facility located in Homer, New York. By this time, three generations of Barden's: G.L. Barden and his son, Bryce, and Bryce's sons Rick and Tom, were also joined by Bob Gelder, a long time family friend, and together they steered the company to what it is today. Today, Barden continues to operate at a steady pace with the fourth generation stepping into the forefront of the company. Rick's son, Mark, is President, Bob Gelder's son, Tim, is Vice President and Chief Financial Officer. Barden currently has a network of over 100 independent dealers who provide an autonomous distribution system to valued customers. In 2001, Barden delivered its 15,000th home, which was cause for celebration as a ribbon cutting ceremony took place at the Homer facility. In the Summer of 2006, Barden opened a brand new, state-of-the-art production Middleport, NY, replacing the Homer plant that they had outgrown. Not to be outdone, in 2005, Barden Building Systems became international with operations in Ontario, Canada. Barden has also created an industry leading, online computer database system where customers can literally order a house online, through an independent dealer, and follow its progress from start to finish, thus creating a paperless environment. In keeping with the ideas that were instilled by its founders, George L. Barden and Roscoe J. Robeson, the Barden & Robeson Corporation continues to be family owned, and the long line of quality, precision and tradition that were instilled over 90 years ago are still evident today. Starting as a wagon wheel parts manufacturer in a small town in upstate New York, Barden Building Systems has evolved into one of the premier home material supply companies in the Northeast United States.